The M/V Balmoral sticks out in my head as one of the ships that embarked on the commemoration sail for the centennial commemoration of the Titanic disaster. She was at the wreck site on night of the anniversary of disaster, sailing on to New York City. She has been to St. John's a few times, the most recent being last Sunday. It was her second stop in a month long cruise through Canada and the States via the St. Lawrence River, focusing on the beauty of these places during the fall. The Balmoral was originally constructed in 1988, and was reconstructed in 2007. The project added 30m to her amidships and a number of extra passenger and crew cabins. She's currently the operating company, Fred. Olsen Cruise Lines', largest ship, and is busy all year long. She's smaller than some ships we see in port (smaller than even some this week), but she is a frequent visitor, and it's always nice to see her grace the harbour. This is the second time that I have seen the AIDAluna in St. John's. With her colourful hull, complete with smiling face across the bow, she's not one that you forget easily. Towering over the city skyline, this ship arrived at 8am on Monday morning, leaving shortly after 6pm. 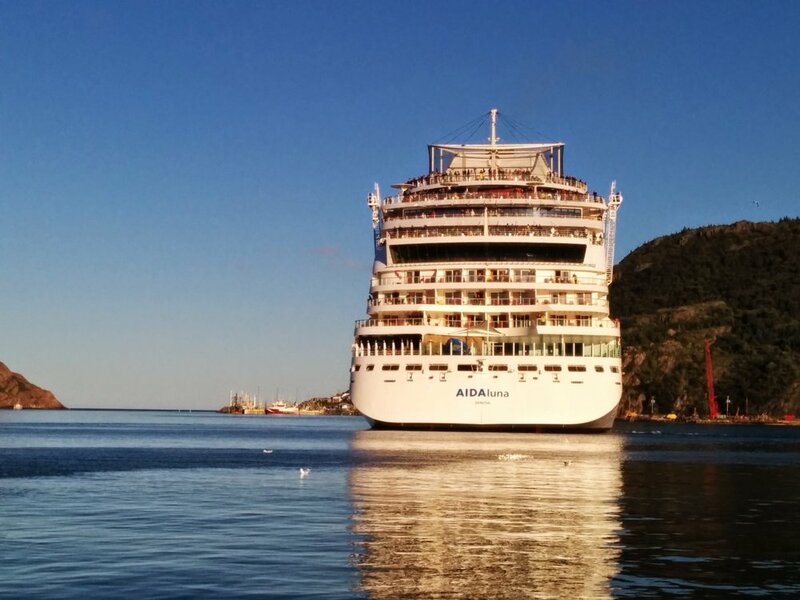 Owned by Carnival Corp and operated by AIDA Cruises, St. John's was her third-last stop on her transatlantic cruise. Visiting Germany, Norway, Iceland and Greenland, St. John's was also the first North American stop on this journey! The AIDAluna is the third ship that was launched in the Sphinx-class of ships, with six ships making up the fleet in total. They vary slightly in size, but they all have the same smiling face across their bow. The AIDAluna frequents the Caribbean, the Baltic Sea, and the transatlantic crossing routes. Her passengers tend to be German, so even though they have an international itinerary, the prominent language on board is German. I absolutely love the smiley face on the front, and the passengers are always very sweet and curious about Newfoundland, in my experience. The Eurodam arrived at lunch time on Wednesday and left around 8pm. St. John's was the third last stop on a 30-day Cruise of the Vikings, which had taken passengers to Russia, Norway, Finland, Iceland and many other locations. They had sailed from St. Anthony (close to L'Anse aux Meadows) and arrived here on a gorgeous day this week. Sailing under the Holland-America Line, the Eurodam (sister ship of the Veendam, which was here back in August) is the 80th vessel to join the fleet, and a Signature-class cruise ship. She usually sails the Caribbean during the winter and the northern routes in the summer, including this Viking cruise. As with other cruise ships, she doubled the foot traffic downtown, and everyone seemed very excited to be here.